Surely somebody knows this one! The Birds was filmed there. Well scenes anyway.... I only know because I Googled the address. We have our first winner!!!!!!! 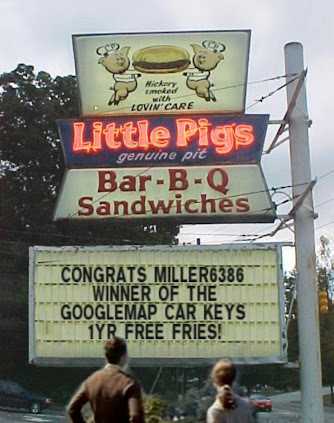 Congrats Miller6386 The Keys to the GoogleMap Car is now in your hands! Take us somewhere and ask your Trusty Androdian Galaxy Note-2 to post a screenshot and see if we can guess where you are! (The hints are in the addresss...or the "driver's" comments. Bigger known landmarks are cool, lets include those for extra 'virtual prize winnings' along with some basic trivia locations. Now go get your winnings man! And dont be stingy!!! We all love some fries!! Last edited by Rico ANDROID; 07-17-2013 at 08:12 AM. Miller6386 and marthinollys like this. Do I get an extra prize If i guess wthout looking up the address!?!?! ?....giving others 5 MINUTES for a chance to play because I know "where you drove the GoogleMap Car" ALREADY!!!! Youve got a good one no doubt! Until you said "hint" in pic., i was going to have to googlemap it...ok 3 more minutes.......man i am itching!!! I wany that CAR! The GoogleMap Car Is In CLEVELAND, OHIO! Miller6386 and UltraDroid like this. Wooooo hoo do i win a lamp?! ?...ok working up a good one. Gimme about 5 min.